Having just reviewed one brand new resort at Kata Beach (Avista), would you believe it, there's another one just opened recently. World economic downturn be damned! 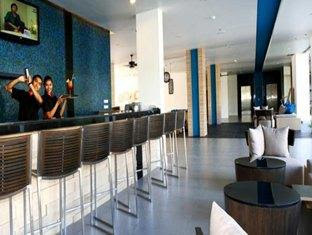 New hotels are a very good thing in a place like Phuket. There has to be growth and renewal in the tourist areas or things might start to get a bit old and stale. Even if occupancy is down this year, there's a strong likelihood that by next year the economies of the world will be on the up again and my guess is that people who maybe cut back on holidays this year will be already saving for an overseas trip. So - hope to see you in Phuket! The Ibis brand is promoted as kind of new and trendy, inexpensive and with everything you need for a great holiday... in other words, nothing too flash... hotels that have the same brand over the world may not suit everyone, maybe they tend to be a bit like a "fast-food hotel". You know exactly what you're going to get no matter which country you are in. 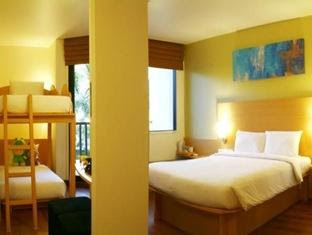 If you want something more original, best look again at my recommended Phuket hotels list, but if you want new, clean, smiley and fresh.. oh, and inexpensive.. (check the rates here).. Ibis is about right. 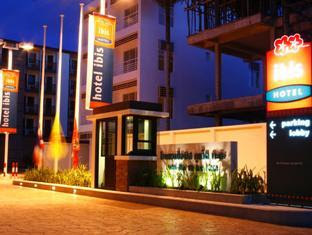 We stayed one time at the Ibis Hua Hin, and had a great nights sleep, everything was just right, and not expensive! The hotel is near (not on) Kata Beach, about a 5 minute walk to the sand. It's in the Kata Center area at the north end of Kata Beach with a lot of restaurants and shops nearby. The only Starbucks in the Kata/Karon area is a few minutes away, as is the Dino Park Mini Golf.